RENATE (Religious in Europe Networking against Trafficking and Exploitation) has welcomed 130 members from 27 countries to Rome for their second European Assembly (6-12 November) where they are reflecting, learning, dialoguing and sharing best practices in their work to combat human trafficking and exploitation. 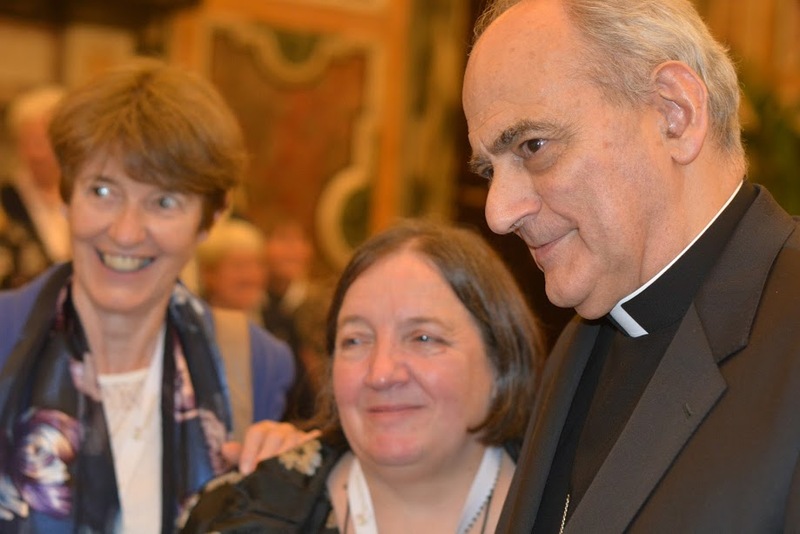 Among those attending the RENATE Assembly are Lynda Dearloversm (GB Institute, Women@theWell), Mary Ryan rsm (The Congregation) and Denise Boyle fmdm (Mercy Global Action). 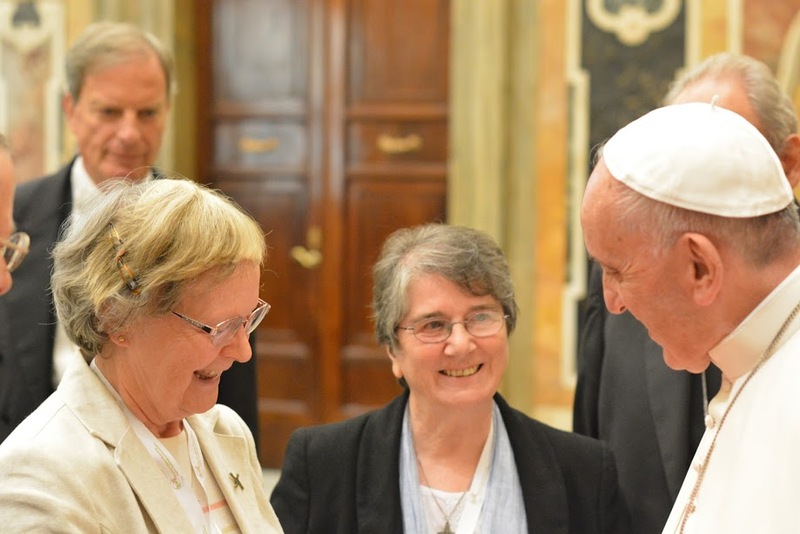 Sr Denise writes: ’The highlight of day one of the RENATE Assembly (Religious of Europe Network Against Trafficking and Exploitation) was the private audience with Pope Francis in the Vatican. All the participants boarded the coaches with great excitement and anticipation. After a circuitous route to St. Peter’s that included security checks we walked through the bronze door into the Vatican. It was almost surreal waiting in the enormous corridor beyond this, watching the Swiss guards go through their routine and knowing that very soon we would meet Pope Francis. Finally we were walking up what seemed like endless flights of marble stairs and into the papal audience room. The Clementine is a magnificent room with a beautiful high painted ceiling. A hush descended just before Pope Francis entered, followed by a burst of applause and an enthusiastic waving of national flags. Smiling almost shyly the Pope acknowledged our greeting as he made his way to a very simple throne like chair, centred on a red dais at the front of the room. Imelda Poole IBVM, the President of RENATE thanked Pope Francis on behalf of the organisation, citing specific ways in which he has raised awareness of human trafficking, especially the suffering of those caught up in it. She went on to say that Francis has offered tremendous support for all those working to eliminate trafficking and who support and work with survivors. The Pope listened attentively and when Imelda finished speaking he jumped up and came down to greet her warmly. In his response Francis began by offering ‘prayerful good wishes for the fruitfulness of these days of prayer, reflection and discussion.’ Reminding us that our Assembly was taking place during the Jubilee Year of Mercy, he spoke of the invitation to ‘enter more deeply into the mystery of God’s mercy and like the Good Samaritan, to bring the balm of that mercy to so many open wounds in our world. Pope Francis believes that among the most troubling of these open wounds is the trade in modern forms of slavery. Acknowledging that much has been accomplished, Francis said that one of the challenges we face is indifference and even complicity plus a tendency by many to look the other way, because powerful networks of crime are involved. Francis thanked us for our ‘faithful witness to the Gospel of Mercy,’ demonstrated by our commitment to the recovery and rehabilitation of victims. Revealing his understanding of the complexity of issues related to human trafficking Francis mentioned the ‘distinctive contribution made by women in accompanying other women and children on a deeply personal journey of healing and reintegration.’ He then shared his hope that our time together during this coming week, will help us be more effective witnesses to the Gospel, ‘in one of the great peripheries of contemporary society.’ Pope Francis concluded his address by commending each one of the group ‘to the loving intercession of Mary, Mother of Mercy,’ after which he gave us his papal blessing. As the loud applause died down, members of the group presented Pope Francis with a St. Brigid’s Cross. This was accompanied by a scroll explaining how the different reeds woven into the cross reflect the 27 European countries in the RENATE network, who are all working to eradicate human trafficking. Previous Previous post: RENATE Assembly features on the US Catholic Sisters against Human Trafficking website.